I.O.C. 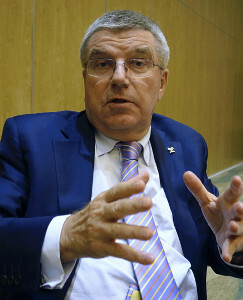 President Thomas Bach (62) in an exclusive interview with The Yomiuri on 25th revealed that IOC IOC is considering positively to stage a part of baseball and softball events in disaster-hit Fukushima. President Bach said that “IOC will let cities other than the host city to stage events if condition permits and found significant. IOC would like to consider in positive and flexible manner.” The Japanese Government intends to stage the events in Fukushima Prefecture to stimulate reconstruction efforts of East Japan Great Earth Quake disaster.